Nancy is mom to four sons, the youngest of whom is Stewart. When talking to Nancy about her children you can see the genuine joy in her face and hear it as she speaks about her children. Stewart receives services from DSC and Nancy shares that he loves the time he spends at DSC. If you are a parent, you know that raising children is one of the hardest jobs you will ever have. Parenting is a sweet mixture of joy, challenges, frustrations, and uncompromising love. 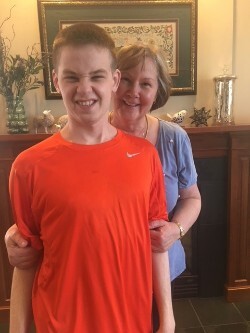 As we celebrate mothers in May, I asked Nancy to share some of the most rewarding and challenging experiences she has had as a parent, and in particular, as a parent who has raised, and still cares for, a young adult with development disabilities. Nancy shares that Stewart has a very pleasurable personality. He is very happy and sweet-natured and these wonderful personality traits emerged when Stewart was a baby and they have never changed. Chuckling, Nancy also shared that since Stewart is non-verbal, she never had to deal with any back-talk from him in adolescence; however, she admits he was really good at stomping up the stairs when he was angry. While we celebrate all the good in parenting, we also have the challenging side as well. When asked what those greatest challenges have been in raising Stewart, Nancy shared, “It’s the future.” She went on to say that as Stewart was growing up, as a parent, the door opens at times and you get a peek into what you think your child’s future might hold. But, when raising a child with a disability, that future is scary. Today, Stewart still lives at home and right now, that is working nicely for the family unit, but Nancy knows that will not always be the case and these decisions are the most challenging for them. Let’s celebrate Nancy and all mothers who do their very best in raising their children every day and let’s offer the support to each other as we understand the depth of this job called “Mom”.